Image | This entry was posted in Field Notes, My Photos and tagged Bird, fall warbler, jewelweed, Silent Sunday, warbler. Bookmark the permalink. Only an expert can tell! 😉 Generally, a fall warbler. Thank you so much, so nice of you to visit! Is that a painting or a photo> Or a photo or a painting? At any rate, it is “picture perfect” and oh, so sweet. Nice rule of thirds composition, Eliza. Yes, I don’t even bother to try with the fall warblers, so many look similar. I was lucky to capture this one – it seemed very interested in me, so it must have been a young one. The adults don’t give you a second look – gone! What a great shot, Eliza! 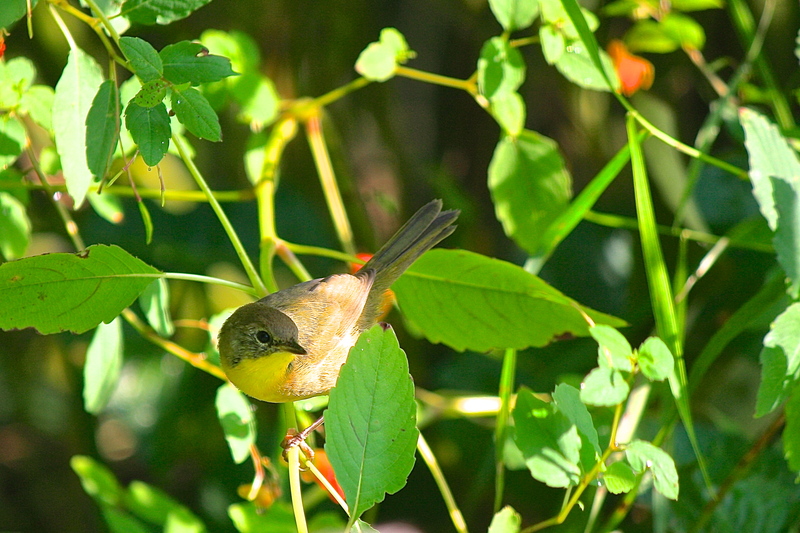 They are hard to get, those warblers, constantly moving and hiding behind leaves, yet you were able to get a clear, perfect shot with beautiful framing as well. Nice! Thank you, Mary. It was a lucky chance. When I saw her in an open spot, I just snapped over and over, hoping I’d get a decent shot before she flew off seconds later. Only two were decent! Yeah, I find it takes hundreds to get a few good ones, but I enjoy taking them so much, it doesn’t matter. That is what I love about digital. I’m not limited to a roll. I love not having that limit and taking as many as I want! It is soooo freeing! I know! It’s like coming back to the computer, downloading and voila! Christmas morning! What a sweet and serene scene. Very soothing.